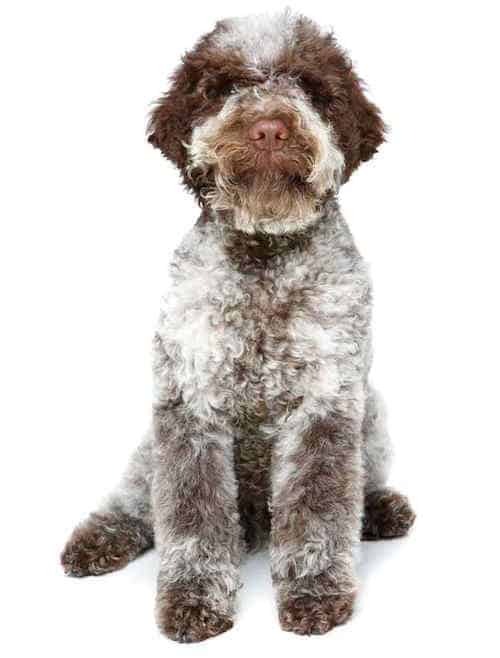 The Lagotto Romagnolo temperament makes this breed an outstanding choice for both a working dog and a pet. The Lagotto Romagnolo (plural: Lagotti Ramagnoli) has a fascinating history because it was bred for a very particular job. It is the only breed in the world specifically bred to sniff out the expensive tubers known as truffles. Although you can train other breeds to search for these scarce delicacies, the Lagotto Romagnolo is the finest truffle hunter in the world. In addition to its keen sense of smell, this Italian “truffle dog” is lauded for its intelligence, determination, and affectionate nature. 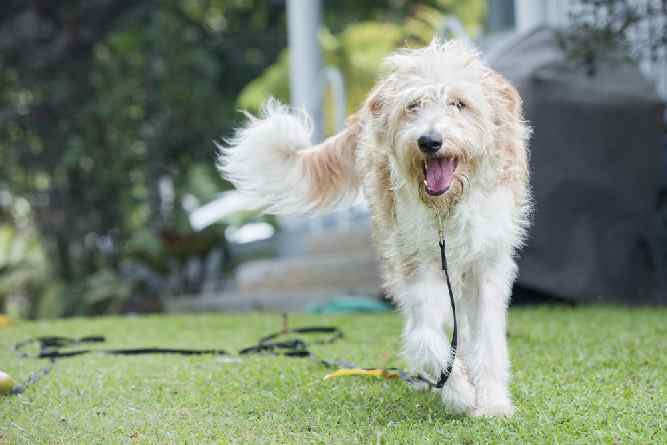 Its distinctive curly coat gives it the endearing appearance of a teddy bear! It might look like a plush toy, but the Lagotto Romagnolo is actually a robust athlete. This breed needs plenty of physical exercise and mental stimulation to stay happy and healthy. Before you bring one home, do your research to see if this breed will match your lifestyle. Lagotti Ramagnoli are energetic but not overly hyper. They are working dogs, so if you are not using your Lagotto Romagnolo to search for truffles, you will need to provide an alternate outlet for its energy. These dogs need daily exercise in the form of walking, jogging, and/or playing outdoors. They are also strong competitors in canine sports. Apart from truffle hunting, they can also participate in agility, nosework, search and rescue, therapy work and dock diving. They are also natural water dogs and love to swim as a form of exercise! The Lagotto bonds deeply to its family. The breed has a tendency towards shyness with strangers. Because of this, early socialization is imperative to help your Lagotto grow up to be more confident and social. Enroll your puppy in a socialization class as soon as possible and expose your pup to as many positive experiences as you can during its formative weeks. The Lagotto is extremely smart and amenable to training. It is attentive to its master and enjoys pleasing its owner. The Lagotto likes a challenge, so owners need to be willing to devote time every day to training and mental enrichment. The Lagotto has a very sweet and affectionate nature. This breed thrives when it is around its family and flourishes with social interaction. The Lagotto Romagnolo loves to be around children and other pets but you must socialize and make proper introductions between all parties early. These dogs definitely do not do well if relegated to the backyard. The Lagotto Romagnolo dog breed dates back to the Italian Renaissance. The first specimens of this breed were actually used for hunting waterfowl. This is why the breed is categorized in the sporting group. The word “Lago” means “lake” in Italian. Over time, the primary function of the breed morphed into truffle hunting thanks to the Lagotto’s exceptional sense of smell. It is crucial to train and socialize your Lagotto Romagnolo from a young age. Sign up for a puppy kindergarten class at the earliest opportunity. Make sure that the classes you attend are based on the principles of positive reinforcement. Avoid any training classes that use “dominance-based” or “alpha” methods. Harsh punishments are not necessary with this sensitive breed. Lagotti learn better and form a deeper bond when their owners employ gentle and positive training methods. Keep training sessions short, upbeat and creative! The Lagotto Romagnolo is small in stature. The breed weighs between 24 and 35 lbs, and stands no higher than 19 inches. The most traditional colors are brown, orange and off-white. Some dogs have white coats with colored markings, but these are less common. The colors of the coat tend to fade as the Lagotto Romagnolo matures. Black coats and black markings are disqualifications. 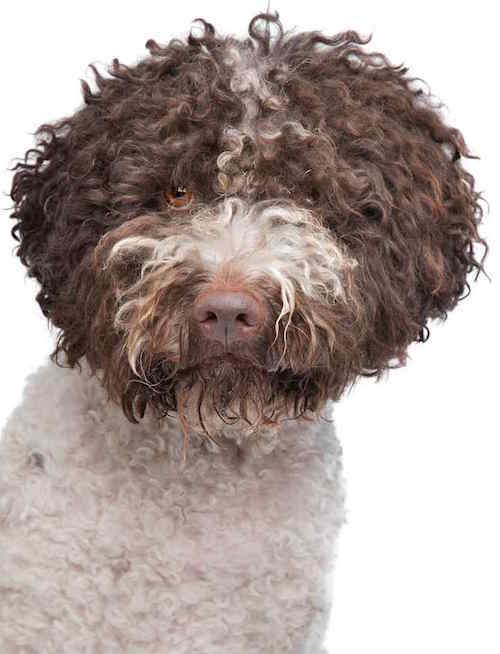 The Lagotto’s waterproof coat forms thick curls over the entire body. The coat should be kept in the “rustic style” with no cording, fluffing or blowing out. The coat is fairly low maintenance day-to-day, but your Lagotto will need a trip to the groomer every few months for professional trimming. 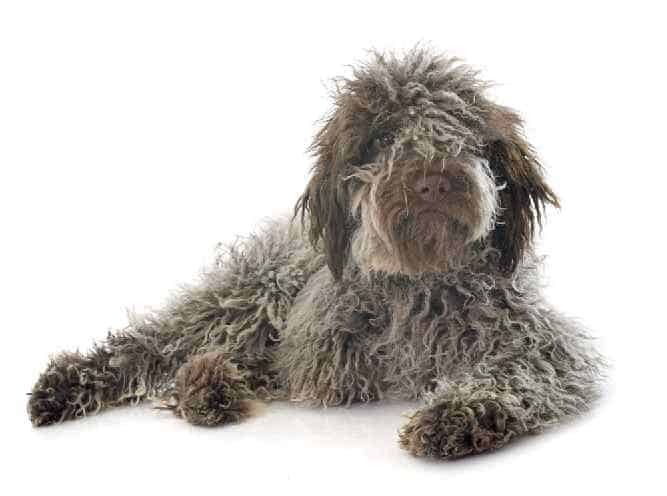 The Lagotto’s coat barely sheds and the hair is considered hypoallergenic. This makes it an excellent choice for dog lovers who suffer from allergies. Like all dogs, your Lagotto Romagnolo should visit a veterinarian every year for a physical exam and vaccinations. Your Lagotto should receive flea and heartworm prevention every month on the same day of every month. Spaying and neutering is highly encouraged and will probably be required by most breeders. Note: If you agree that your health and your dog's health should be a top priority then get a copy of The Ultimate Guide to Dog Health. Your Lagotto friend will love you for it. If you would like to adopt a Lagotto Romagnolo, the best place to start your search is with the Lagotto Romagnolo Club of America. Thankfully, there are not usually too many Lagotti needing rescue at any given time. However, sometimes people suffer life changes and have to rehome their adult Lagotti. You can email the rescue contact to put your name on file for available Lagotto Romagnolo rescue dogs that become available. The dogs that are available through rescue organizations are generally adult dogs. It is unusual to find puppies available for adoption. However, adopting an adult dog can be very rewarding. Lagotti are rare in animal shelters/humane societies, but it is still worthwhile to visit your local shelter and put your name on file for a Lagotto or a Lagotto Romagnolo mix. If you decide to purchase a Lagotto Romagnolo puppy through a breeder, visit the website for the Lagotto Romagnolo Club. They maintain a list of Lagotto Romagnolo breeders who are members of the club and adhere to a code of ethics. Lagotto Romagnolo puppies are hard to find in the United States, so you may have to put your name on a waiting list and be patient until one becomes available. Once you identify a Lagotto Roagnolo for sale, you will need to visit the breeder in person. Ask to meet the parents of the litter. Also, ask to view medical records and the results of any genetic testing. Your breeder will want the opportunity to meet you, too! Responsible breeders want to make sure that you can provide a lifelong home to one of their puppies. Never purchase a puppy of any breed over the internet or through a pet store. Always visit the premises in person. Since this is such a rare breed, be prepared to make an investment. The Lagotto Romagnolo price is generally between $1,500 and $2,000. Conclusion: Why the Lagotto Romagnolo? The Lagotto Romagnolo is an uncommon breed in the United States, but many people consider it a true gem. The Lagotto Romagnolo temperament makes it a sweet and loving family dog. The low-shedding hypoallergenic coat is also a bonus for many people. If this sounds like perfection, the Italian “truffle dog” might be the right match for you!